Derby Industries is proud to introduce our see-clear-ity line of clear bags and clear backpacks. Like all of the products we manufacture, our clear bags and clear backpacks are proudly made with only the best materials. Our see-clear-ity clear backpacks are window clear, constructed using 20 gauge clear PVC, which makes everything inside more visible. We use quality zippers for superior and long lasting performance. All see-clear-ity clear bags and clear backpacks feature welded gussets and zippers to enhance the products’ life cycle. Our entire product line of clear bags may be easily cleaned with just soap and water. We offer a warranty against manufacturing defects. Many correctional facilities have mandated that any backpacks, lunch bags, briefcases, purses, or duffle bags brought in or out by staff must be clear. The use of clear backpacks and clear bags offers added security to casinos, school corporations, retail stores, behavioral healthcare facilities, or virtually any setting where it is imperative to see what enters and exits your facility. We offer you the ability to place your orders online. 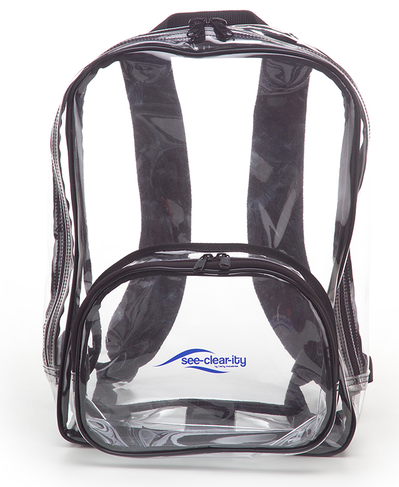 Whether you want a single clear backpack for your child to haul around homework or you want to order clear bags for all of the staff in your facility, our see-clear-ity clear products will exceed your expectations.